Inder Loves Folk Art: Me Made May Part 1. Um, yeah, it is May 24, and I'm just now getting around to posting my round-up of the first half of May. So it goes! The first half of May was a bit chilly, and I wasn't feeling well for much of it, so warmth and comfort reigned supreme. So far, I've managed to wear me-mades every day of May, only copping out and wearing me-made pajamas once (so far). With me not feeling well and the chilly weather, this year's Me-Made-May definitely feels harder than last year's, and I started to hit "selfie fatigue" earlier in the month. I am also paranoid that I am boring the living daylights out of my non-sewing-instagram-friends! But I really enjoy seeing everyone else's #MMMay16 photos, so I'm taking one for the team. 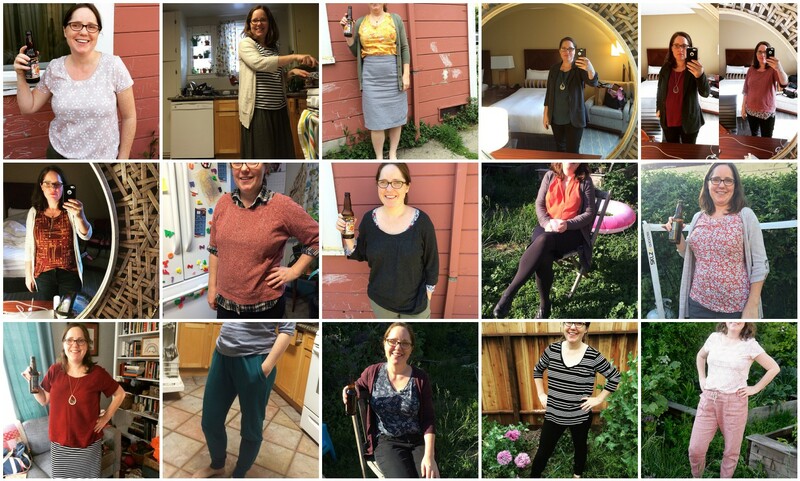 Seeing how everyone styles their me-mades is really interesting and fun, and gives me so many ideas for more selfish sewing. It's worth it! Takeaway of MMMay Part 1: I wear t-shirts every chance I can get. What about you? What are your most-worn me-mades? I love seeing your Me Made May photos! It's always so amazing to me to think of having a handmade wardrobe. I am in awe of you guys! I love my tees, tees and jeans so not much use posting my me-mades.